Peter Balaskas' introduction to the Short Story Panel Discussion. 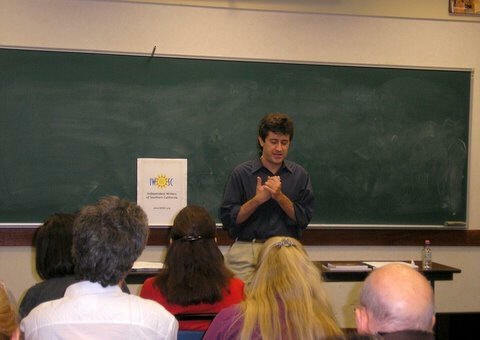 Peter Balaskas teaches his Short Story Seminar class for the Independent Writers of Southern California. 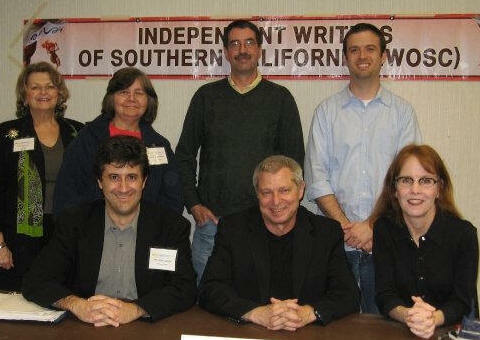 Blog Talk Radio - August 21, 2009 - 10:30 a.m.
Robin Gorley on West Coast Authors live blog/radio. It's a call-in show, so get your questions ready and give the show a ring. Part 1 (8 min, 40 sec): Introduction of the panel and a reading from Peter's book, "The Grandmaster." Part 2 (6 min., 40 sec): Peter answers two questions regarding the creative writing process. Both segments have "More Info" off the YouTube link. Radio show host Michael Dresser along with Gary Seeley interview author Peter Balaskas about his book "Grand Master." Radio show host John Seeley talks with author Peter Balaskas about his book "Grand Master," a supernatural thriller that takes place during the Holocaust. Appearing in two segments: "Featured Guest Author Peter Balaskas" and "Writer's Tips"
"Arts and Roots Forum" March 14, 2008 at 4 p.m. Host Martin Perlich interviews Ex Machina Press Founder Peter A. Balaskas and Associate Editor Mark D'Anna. Listen as they talk about Peter's independent publishing company, Mark's story collection "Big Brown Bag," and Peter's short story "Duet," which is featured in the award-winning Silent Voices: a creative mosaic of fiction, Volume Three. "Center Stage," January 29, 2008 at 7:30 p.m.
"Center Stage" interviewed Mark D'Anna, author of the award-winning short collection "Big Brown Bag." Listen to Mark as he talks about his book, his approach to the creative process, and the art of the short story. "Center Stage," February 20, 2007 at 7:30 p.m.
"Center Stage" interviewed Peter A. Balaskas and Mark D'Anna. Hear about the origins of Ex Machina Press and Silent Voices, the art of good storytelling, and how their experiences at Loyola Marymount University helped focus their passions for their writing and publishing. "Arts and Roots Forum" November 9, 2006 at 4 p.m. Host Martin Perlich interviews Ex Machina Press Editor and Founder Peter A. Balaskas. 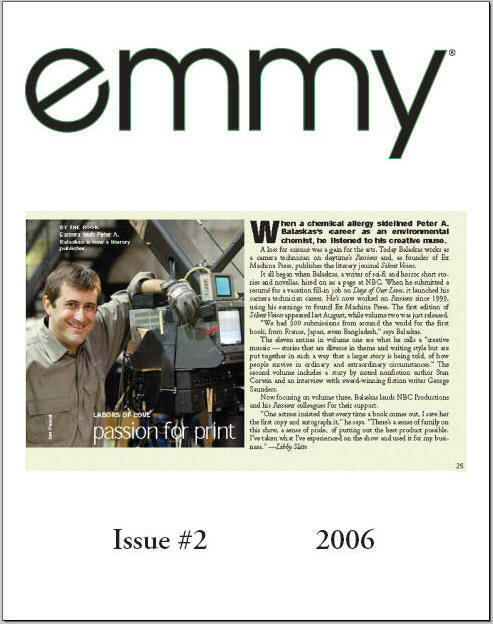 Listen in on the origins of Ex Machina Press, Peter's experiences as a writer and a crew member on the NBC soap opera "Passions" and all other exciting stuff. "Silent Voices: Volume Four" awarded Runner Up in the Anthologies Category at the San Francisco Book Festival. "The Grandmaster" by Peter A. Balaskas awarded Honorable Mention in the Science Fiction Category. "Ex Machina Press Keeps it in the LMU Family"
"Silent Voices: Volume Four" wins Best Anthology at the 2008 DIY Book Festival in Los Angeles. This is the second consecutive year that Silent Voices has won in its category. Also, "The Grandmaster" by Peter A. Balaskas awarded Runner Up prize. "The Grandmaster" by Peter A. Balaskas wins Best Science Fiction Novel and "Silent Voices: Volume Four" awarded Honorable Mention in the Anthologies Category at the New England Book Festival. "Cal State book fair honors disappearing independent booksellers"
Silent Voices Volume Four receives Honorable Mention at New York Book Festival. Silent Voices, Volume Three Wins at the 2008 London Book Festival! Ex Machina Press sweeps at DIY Book Festival in Los Angeles, winning Best Anthology, Best Unpublished Short Story, Honorable Mention in General Fiction, and 2007 Publisher of the Year..
Silent Voices Volume Three receives Honorable Mention at New York Book Festival. Site of LMU, the staff's alma mater, located in Los Angeles.